Several different groups, each with their own agenda, interact to make this confusing and enticing plot. One of the Middle Eastern *stan countries is massively in debt. The country comes up with a kooky plan for repayment. They grant secession to a small part of the country, even though that area doesn't want independence. Most of the people in the area are unemployed and take off. The new country is tiny, has miniature population, and has 80% of the original country's national debt. They concoct a scheme whereby people invest in the new country thinking it will fail, but the plan is really to make a lot of money on those investments and re-unite the country. To help out with us, the *stan country hops in bed with an organized crime group known as the Operation. The Operation is filled with psychopaths. In the olden days (our days) these people would have headed up corporations, but corporations are now expected to have social responsibility in return for the personhood corporations are granted. Psychopaths are only good for their own short term, not the long term success of a company. So, the organization finds budding psychopaths and trains them. They set up illegal operations and then sell them off. Since you can't market illegal stuff through legitimate channels like magazine advertisements and billboards, marketing must be done with spam. Spam filters are good. The competition in illegal markets is good too. The Operation wants better spam filters for the competition and better spam bots for themselves to get their advertisements through. Which leads to a third group of mostly academics who’ve made an AI that specializes in social engineering. Apparently the group started off analyzing spam and moved into social engineering. The AI analyzes peoples’ emails and social networks and figures out who is at risk for what. Then the AI got smart and conscious and started killing. But when reading the book, you don’t know any of that until about half way through the book. 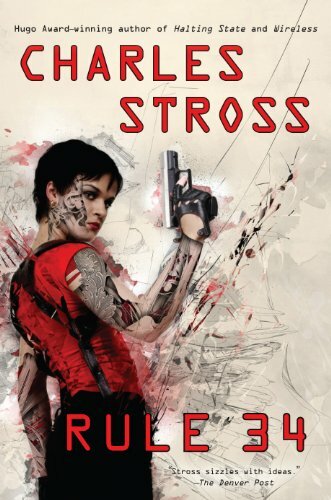 Stross gives you a character a chapter and each chapter is devoted to that character’s perspective and knowledge. Stross brings up lots of fun topics that are in today’s news. Many CEOs are psychopaths. Colleges are in decline and a college education is bourgeois due to the expense. People of the same gender can marry. Public transportation doesn’t need a driver, and the vehicles can be bribed to go off route in a bidding process. Free will is an illusion. Augmented reality is all over the place. There’s one other major point of interest in Rule 34. Now, I must say that I wouldn’t have caught on to this little tidbit. That is, I wouldn’t have noticed it, if I didn’t read Stross’ blog. (I guess it’s a little bizarre that I read his blog for months before I ever read a book of his.) The book had three primary, main characters in it. The only one that was a pure heterosexual was also a psychopath. After reading his blog post and then looking back at the story, I had a little internal chuckle.